The 558 is one of many express buses in the 500s that travel on the Mass Turnpike from downtown. In this case, the bus goes to Riverside, although taking a very indirect route. It is also the highest numbered bus route operated by the MBTA. It starts at the intersection of Federal and Franklin Streets downtown, about halfway between Downtown Crossing and South Station. 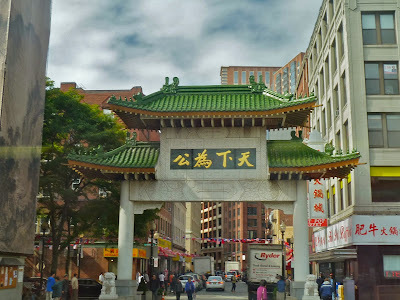 My father and I chose to use Downtown Crossing, and were late for the bus as usual. 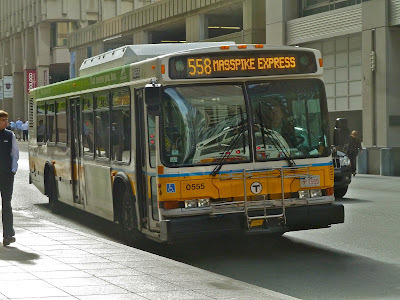 Luckily, being an MBTA bus, the 558 was late as well, and we were able to catch it at the beginning of the route. From there, it navigates through heavily trafficked one-ways and stops at Otis and Summer Streets (remember that?). 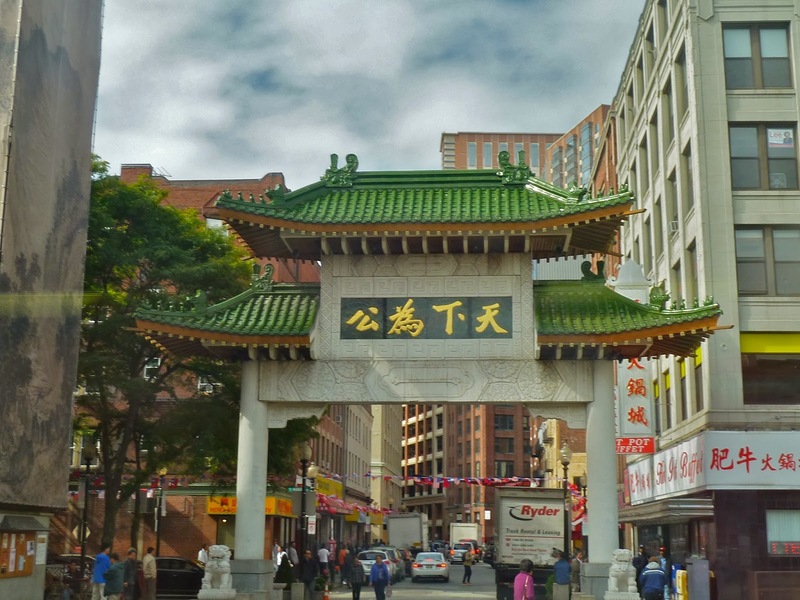 From there, it continues making random turns until reaching Surface Road, where it goes by the not-so-famous Boston Chinatown Gate, and then turns off onto the Mass Turnpike. In all its glory, here it is. On the Turnpike, the bus goes fast. Like, 75 MPH fast. There was no traffic mid-afternoon on Columbus Day, so the bus just sped along the highway. It passes by the John Hancock Building (barely visible before the Turnpike goes into a tunnel)and Fenway Park before hitting a toll plaza. I was wondering what would happen here, and it turns out trucks and buses have their own special lane at the toll. It gets pretty suburban by the time the bus takes the exit at Newton Corner. It follows the other "550" buses down Washington Street for a bit before turning off at Adams Street into a residential neighborhood. It turns onto Watertown Street (where there are a few businesses) for only a few blocks before turning again onto Chapel Street and going by a business center. Then it turns onto California Street and again onto Bridge Street, crossing over the Charles and entering Watertown. It's fairly industrial once the bus turns onto Pleasant Street right after Bridge. There are a lot of car dealerships and office parks in this neighborhood. The industry ends right about where the bus enters Waltham, and Pleasant Street turns to River Street (it's not in Watertown for very long). There are densely packed houses, as well as an amphitheater-esque building. The houses turn to businesses as the bus comes into Waltham Center, connecting with the 70, a few other "500" buses, and the Commuter Rail. It follows the other buses down Moody Street but shortly turns off at Crescent Street. This is more residential than Moody, but soon a massive factory pops up. Soon after the bus turns onto Woerd (pronounced "word," I think) Ave, and yet again onto Rumford Ave, which is also pretty industrial. It then turns again onto Lexington Street back in Newton, where there are connections to a few other buses. Travelling down Lexington Street along with the 505, they reach Commonwealth Ave (imagine if the B Line went out here) and split off. The 558 goes right, leaving behind the minor businesses of the intersection for a more residential area. Passing a Marriott, the bus crosses over the Charles River and then merges onto I-95. It's not on it for very long, though, turning off at the very next exit onto Grove Street. It passes by the good ol' Hotel Indigo, and then turns into the Riverside parking lot. The 558 way back in downtown. Lovely picture, if I do say so myself. Ridership: One thing's for sure, no one took this from beginning to end. The ridership was sort of split into two chunks: Downtown to Waltham, and Waltham to Riverside. That being said, a fair amount of the people that rode it (around 20 for our ride) used it for just local service around Waltham. Pros: Cuts out a nice route through Waltham that serves a lot. The express to Boston is fast, but probably not during rush hour. Ridership was decent, but not excellent. Cons: The schedule is pretty darn terrible: the bus runs weekdays only, about every hour. On top of that, four out of the ten trips the bus makes in a day only run from Riverside to Newton Corner. I feel like it should at least have limited Saturday service. The bus is obviously not faster than the train - from Downtown Crossing to Riverside on the bus is about an hour, while the train from Riverside to Downtown Crossing (utilizing the Winter Street concourse between Park Street and the latter) is only 45 minutes. Finally, the bus is very curvy, although as there aren't that many traffic lights (or traffic in general) along the route, it's not nearly as much of a problem as it is for the 83. Nearby and Noteworthy: Other than downtown and Newton Corner, not much. It was a mostly residential/industrial route. Fenway Park and the John Hancock Building were visible, but that doesn't really count. This is one of those buses that I don't see what's wrong with it until I actually do the post. The schedule was sort of a deal breaker in my opinion, although the Waltham area is pretty under-served in general, at least on weekends. But think about it: the 76 gets at least a pseudo Saturday service and it got about the same amount of riders as the 558. However, the impractical transit geek in me says it's still a very fun ride. It's also the highest numbered bus operated by the MBTA (not including contracted buses), which is kinda worth checking out, right? The MBTA is starting work on the Government Center Station rehabilitation project. This unfortunately means the station will be closed for two years starting spring 2014. Also, a lawsuit has been filed against the MBTA for displaying pro-Israel ads at various locations.